Storm ready. A permanent home generator is located outdoors, protected by a steel case. It’s designed to turn on automatically if utility-supplied power is interrupted. It's not a matter of if severe storms are going to happen, it's a matter of when. Don't wait for the next power outage! Serving Central and Upstate New York, Halco customers are familiar with severe weather. Keep your home and family safe during heavy snow and extreme lows in winter, to high winds and thunderstorms in the spring and summer. With a properly sized home generator you can stay up and running when the grid goes down. An automatic home generator will immediately kick on when your power goes out, keeping your home comfortable in some of the most dangerous storms. Cover just the essential electrical items like your lights and furnace, or go with a bigger unit that will restore all the conveniences of modern living, like central air and communication means. When the power is disrupted, our lives seem to come to a sudden stop. With a generator that restores power within seconds of an outage, you can put your worries to rest knowing that you have all the power you need. If you're interested in getting a permanent solution to protect your home from power outages, call us at 1-833-844-2622 today or click below for a quote! If not set up or operated correctly, portable generators can pose safety hazards. That is why at Halco, all of our generator installations are permanent rather than portable. Permanent generators are installed in a safe location and have durable and sturdy components that are perfect for all weather conditions. All backup generators that we install run a weekly test to ensure your system is performing properly. With a digital controller and LED status indicators, you can stay prepared for the unexpected. Generac has nearly 60 years of experience providing home electrical solutions and backup generators. 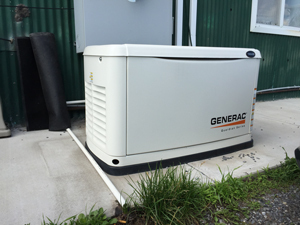 Generac was the first to engineer affordable home standby generators, and they remain the #1 name in home backup generators today. The Guardian Series generators are not only equipped to automatically start up within seconds of power loss, but also automatically turn off with the return of utility power. They are designed to run at a lower RPM to ensure a quiet appliance with little disturbance. The QuietSource Series are engineered to run at a substantially low RPM for discreetness & reduced fuel consumption. Its liquid-cooled engine ensures a powerful performance. Severe weather is something that is unavoidable. It could be something as common as a thunderstorm taking out the power lines, or it could be something much more damaging. No matter what happens, be prepared for the next power outage with a new generator. Contact us to get an estimate on permanent standby generator solutions! Halco provides generator services in Rochester, Ithaca, Syracuse, Webster, Auburn, Fairport, Pittsford, Cortland, Canandaigua, and neighboring areas in The Finger Lakes.